These spacious pitches include electrical hook-ups. There are hot showers in spacious cabins and toilets located in the main field. Drinking water is available from numerous taps throughout the campsite and you can also connect to the WIFI too. Dogs are welcome with an additional charge of £3 (you can book these from the extras menu). Please do not bring your own firewood as we need to know what's being burnt. When you arrive at the reception you can hire additional extras such as towels, sleeping bags, camping beds and cables. If you wish to venture from the campsite and visit Cheddar Village or Cheddar Gorge be sure to pick up a brochure at the reception. 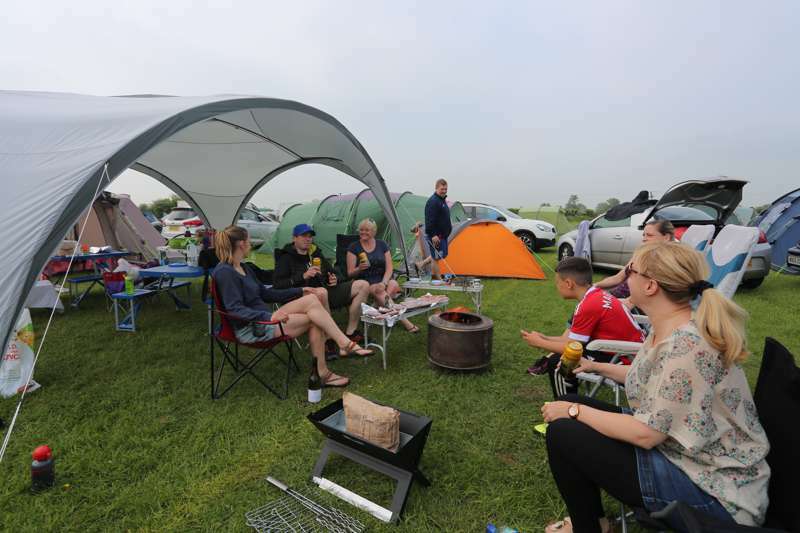 Petruth Paddocks is a relaxing campsite where anyone can visit and feel immediately at home. A live-and-let-live place where there are refreshingly few rules, kids can be kids, campfires are encouraged, music and bad singing are not a problem and people feel free to wander round making new friends. Petruth Paddock is on the doorstep of Cheddar Village and Cheddar Gorge – voted the second greatest natural wonder in the UK. Cheddar Gorge is packed with tons of activities such as rock climbing, abseiling and exploring the caves and learning about the heritage and history of this fascinating natural feature. If you are intending to make a large group booking please visit our website and click on the ‘Group Bookings’ tab. There are toilet and shower blocks in the corner of the main field, near the gate to the chill-out field: 8 Showers, 6 ladies, 4 Gents plus urinals. Campfires are encouraged with firewood delivered to your door every evening (sack of logs £5 and kindling £2.50). Ride in the trailor when logs are delivered. Drinking water is available from numerous taps throughout the campsite. WiFi onsite. 400 pitches, 150 with electric hook-ups. 12 hard standing pitches. A 6 berth and an 8 berth tipi also available for hire. It's a five minute walk into Cheddar and a 15-20 minute walk to the start of the gorge (01934 742343). Here activities include rock-climbing and abseiling on the gorge cliffs, exploring the caves and the Wookey Hole or learning about the heritage and history of this fascinating natural feature. Those on bikes should visit by following The Strawberry Line, an excellent cycle route following the old railway network. Walk the Droves, adjacent to the site, or head into the Mendip Hills Area of Outstanding Natural Beauty (01761 462338). Those taking the car will find the cities of Bath and Bristol are both 45 minutes away, though if you do head in this direction, walking Brean Down (01452 814213) and visiting Berrow Beach should also be high on the list. Wells (01749 671770) city is closer than its more famous neighbours and a rather undiscovered gem, with an intriguing history and beautiful cathedral (01749 674483). Glastonbury is also close by, with original, quirky shops, along with the famous Abbey (01458 832267) and Glastonbury Tor (01934 844518). The Café opposite the monument in Cheddar serves delicious hot food, cakes, teas and coffees. Pub-wise, The White Hart (01934 741261) in the Gorge has a dog-friendly beer garden and offers discounts to Petruth Paddocks campers. The Rodney Stoke (01749 870209) on the Wells Road is good for big parties, with great views across The Levels, a large garden and play area. The Riverside (01934 742452) with adjacent car park and beer garden is also a good choice, located at the beginning of the road to the Gorge in Cheddar. There are also Thai, Indian and Chinese restaurants in the village. Two nearby supermarkets are on hand: Tesco Express, at the end of the footpath into the village, and the larger Budgens (01934 744546) nearer to the campsite. If you are walking, it is on the road into Cheddar before the turning to the Gorge, down a short road to the right. If you are using sat-nav, punch in the postcode BS273XW – that’ll get you to Cheddar – but make sure it gets you to the A371 and not a little track off the B3151! A371 From Wells direction you will pass Winchester Farm/ and the Kart track on your left. This is Immediately followed by a nasty S bend, then take the 1st left into Labourham Way. As soon as you’ve turned off the main road, take an immediate left - you then have three options – take the middle one through the gates with the wooden Petruth Paddocks sign on your right. Follow the track into the next field and park on the hard-standing. From the A38/Axbridge direction take the A371 through Cheddar village. Pass the football club on the right and take the 1st right after this into Labourham Way. As soon as you’ve turned off the main road, take an immediate left - you then have three options – take the middle one through the gates with the wooden Petruth Paddocks sign on your right. Follow the track into the next field and park on the hard-standing.